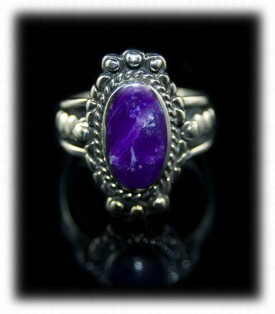 Durango Silver Company has been in the business of producing Hand Crafted Silver Jewelry for nearly forty years. We produce quality Silver Jewelry on-site here in Durango, Colorado USA and we handle Native American Hand Crafted Silver Jewelry which is made locally. We have collected and mined the highest quality American Turquoise for over forty years and we have some of the finest quality Turquoise Hand Crafted Silver Jewelry coming out of the Southwest today! 925 Silver Jewelry is some of the most popular jewelry in the world. Hand Crafted Silver Bear Claw Necklace was made by John Hartman of Durango. 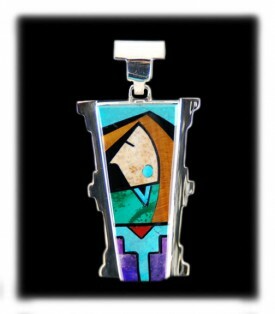 This mens Turquoise Necklace is a one-of-a-kind work of Southwestern art. 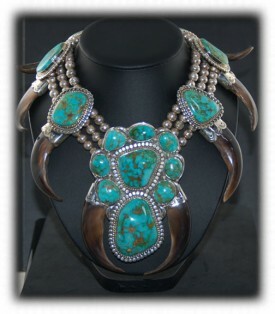 This necklace has 17 high quality Stormy Mountain Turquoise stones with a combined weight of over 400 carats. It has eight Kodiak Bear Claws that are awesome, natural, and giant. The silver work in this necklace is extensive, the bottom piece of the necklace took Dillon and John both to solder! 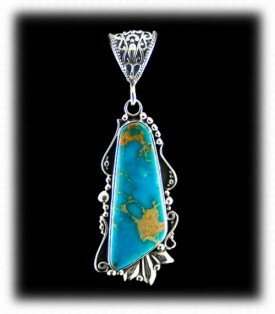 The natural Stormy mountain Turquoise cabochons used in this masterpiece were all cut from one Turquoise nugget. This rare American Turquoise nugget was mined from the Stormy Mountain mine in Nevada in 1969 by Cutler Edgar and cobbed out by John and Estell Hartman, who at this time worked with Cutler mining the Stormy Mountain mine. The Hartman’s cut the nugget in 1970 and it has been in the vault since. This is probably one of the largest, highest quality bear claw necklaces you will ever see and it is a fantastic example of Hand Crafted Silver Jewelry. We invite you to check out the Hand Crafted Silver Jewelry we have available today, also check out our design portfolio that has many of the pieces we have sold at Durango Silver Co in the past. 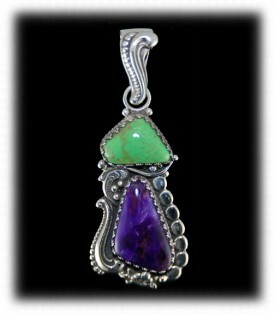 Above and to the left is a Hand Crafted Silver Gaspeite and Sugilite Pendant that was made by John Hartman of Durango Silver Company in his unique Victorian Silver Style. 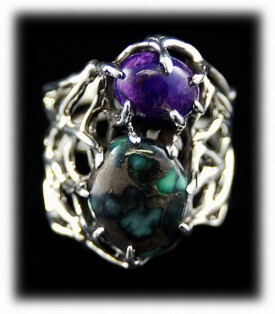 It features a fabulous Gaspeite stone and an equally fantastic Sugilite stone, both of gem quality. The stones are set in a fancy filigree bezel and then surrounded with a Victorian Silver motif that is unique to Hand Crafted Silver Jewelry made only by John. 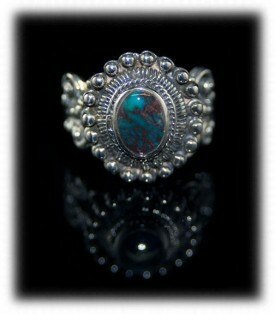 To the right Victorian style Women's Bisbee Turquoise Ring by John Hartman. This Turquoise ring features a small oval of deep blue Bisbee Turquoise Gemstone set in an elaborate Sterling Silver setting. This natural American Turquoise cabochon is surrounded by Victorian filigree designs. Durango Silver Company produces unusual pieces of Hand Crafted Silver Jewelry with exceptional Gemstones as well as outstanding Silverwork. Above and to the left is a fantastic pictorial inlaid Native American Silver Pendant handcrafted by Edison Yazzie, Navajo Artisan. This is a wonderfully executed and artistically designed piece of hand crafted Silver Jewelry by an accomplished Navajo Artisan. The design is of a Native Woman at Navajo Mountain and by the water. This marvelous Native American Silver Pendant is inlaid with Turquoise, Sugilite, Jasper, Black Jade, Spiny Oyster Shell and Malachite. Edison's Silver Jewelry exquisitely inlaid with gemstones is fantastic, we highly recommend it and we try to have as much as possible on hand at all times. This is a great example of handcrafted silver. To the right is a free form, Victorian Fusion, Electric Blue, Turquoise Mountain Pendant by Dillon Hartman. This pendant is unique and focuses on an electric blue Turquoise Mountain cabochon that has wonderful golden yellow matrix. The Turquoise comes from Kingman, Arizona. The stone is surrounded by filigree, raindrop and repose designs that tastefully combine Southwestern and Victorian Jewelry styles in new age Hand Crafted Silver Jewelry. Above and to the left is a two stone Sugilite and Damale Turquoise Ring by Nattarika Hartman. This beautiful Sterling Silver Ring features two gorgeous gemstones, one oval natural Sugilite cabochon and one freeform Damale Turquoise Cabochon. It was hand crafted in wax and then the lost wax method was used to convert the wax to Silver. Each piece of Nattarika's sculpted Silver Jewelry items are unique pieces of hand crafted Silver Jewelry. To the right is a women's Sugilite and Sterling Silver Ring that will make your finger beautiful and you’re your chakra happy! This Silver Ring has fancy stamp work with a raindrop and rope design. This oval Sugilite Ring was hand crafted by Dillon Hartman featuring a top grade royal purple African Sugilite gemstone that he cut as well. Sugilite is a healing gemstone that is highly sought after by holistic healers around the world. We have a very large collection of Sugilite and always have a lot of Sugilite Jewelry available. We hope you have enjoyed our presentation on Hand Crafted Silver Jewelry and have gained some useful knowledge from it. We invite you to learn more about Hand Crafted Silver Jewelry and American Silver Jewelry by following the links in our Learning Center to other informational pages that we have written on different topics related to Turquoise Jewelry. In addition, we would like to invite you to join our E-Mail Newsletter - about once every other month we send out a Newsletter to inform our members of what's happening with Durango Silver Company, new products, specials for our members and more. We also have a monthly drawing from our member base to give away free Turquoise Jewelry from our company. Please take a moment to become one of our friends by signing in below. We thank you for your time and hope you will think of Durango Silver Company the next time you are considering Hand Crafted Silver Jewelry.